From basic pouches that fit on your belt, to the high-end tournament packs used by professional paintball players, Badlands has the paintball pack and harness for you. Packs & Harnesses There are 54 products. 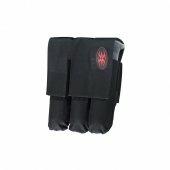 The body wrap design of the Killhouse Weapon Systems 2+1 Black ensures maximum fit and comfort. 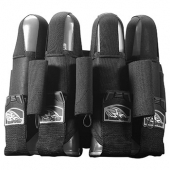 The body wrap design of the Killhouse Weapon Systems 4+1 Black ensures maximum fit and comfort. 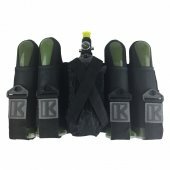 For the recreational woodsball paintball player, the 4+1 harnesses are the most popular choice because they offer the flexibility of carrying your air tank on your back, allowing you to run your paintball gun off a remote line. If you have no interest in playing with a remote line, then a simpler 4 or 5 pod harness will often do the trick. 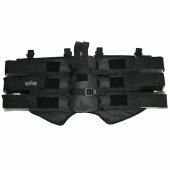 The higher-end paintball harnesses feature comfort belts that use a two-layer belt system to hold your pack in place comfortably and usually have elastic pod loops that fold away once the pod has been pulled from them, giving the empty pack a much smaller profile. Stay fully loaded with paintballs with a BT Pod Pack. BT’s magazine pack allows a player to carry eight 140 round paintball pods with the easy ability to return empty paintball pods in a magazine feed fashion. Be the heavy gunner of your paintball team by staying loaded with paintballs. Dye paintball pod packs give you the speed you need to quickly reload or top up your paintball hopper. With the easy pull straps and elastic ejection, you can seamlessly retrieve full paintball pods to keep your paintball gun firing. Designed and used by the pros, wearing a Dye paintball pod pack will give you the pro edge. Empire paintball pod packs work well with every player. Empire Produces a wide range of paintball pod packs extending from the entry level paintball player to the professionals. 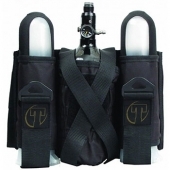 If you need to get your tank off of your gun to reduce overall weight you can suit up with a 4+1 paintball pod pack which can carry four pods and a paintball air tank. 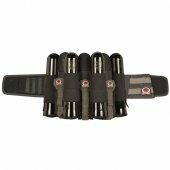 Gen-X paintball has been keeping paintball players equipped with the gear they need at a great value. 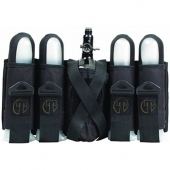 Gen-X paintball has a wide variety of paintball pod packs to suit every paintballs player’s preferences. You can get paintball pod packs that hold tanks and multiple paintball pods. Get what you need from Gen-X paintball and get on the paintball field. 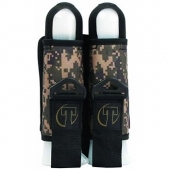 GI Sportz specializes in producing the highest performing paintball gear. 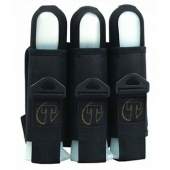 GI Sportz paintball pod packs will give you an edge with their fast east to use holster straps. GI Sportz offers a huge variety of paintball pod packs including 2 pod harnesses, 3 pod harnesses, even up to a 5+8 capacity paintball pod pack. GI Sportz paintball pod packs are used by the pros and available to everyone. Get your hands on some of the highest performing paintball pod packs. HK Army has challenged conventional paintball pod packs and taken them to the next level. The Zero-G Harness has changed the future of paintball by eliminating the need for straps to hold your paintball pods in place. Capable of carrying up to eleven paintball pods, you will never have to worry about fumbling around with straps when trying to load your paintball hopper. Check out the awesome colors that HK Army has to offer with their futuristic paintball pod packs and make your choice to enter into the realm of high-performance paintball play. 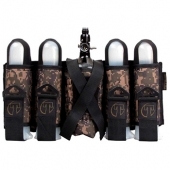 JT paintball pod packs have every paintball scenario in mind when producing their products. From the tournament style player to the scenario paintball player. 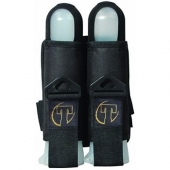 JT paintball creates products that are high quality, functional and at a low cost. 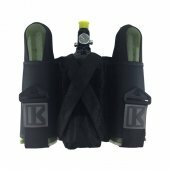 Get a 4+1 paintball pod pack to stow your tank on your back or wear the comfortable tournament paintball pod pack for serious competition. 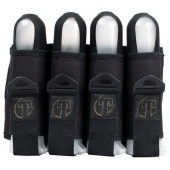 JT paintball has the products you need to keep your paintball gun rolling. NXE is a legend in the sport of paintball for providing players with dependable paintball pod packs. Providing paintball players with a series of different paintball pod packs to suit scenarios players and tournament players. Get an NXE Paintball pod pack if you want a pack that is easy to use and will ensure your paintball playing style. Planet Eclipse only allows paintball players to play with the highest quality products. The same goes for their paintball pod packs. Teaming up with NXE and BK to create the best possible paintball pod packs to eliminate one more thing to worry about while playing paintball. 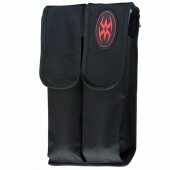 Planet Eclipse offers strapped paintball pod packs and a strapless paintball pod pack. Take your pick with a Planet Eclipse paintball pod pack and feel what it’s like to have the comfort, reliability, and function of a high end performing paintball pod pack. If you don’t need the capacity of a full-size paintball pod pack or you want something built on dependability, Tippmann has the paintball pod pack for you. Ranging from 2 paintball pod harnesses to 4+3+2 paintball pod harnesses you have the freedom to choose exactly what you need to accommodate your paintball set up. With NXE technology, Tippmann has accomplished to meet the needs of the scenario player and the tournament player.